This website catalogs and interprets the coast defense sites I have spent time visiting and researching in the New England states (Massachusetts, Rhode Island, New Hampshire and Maine). Thus far, the harbor defenses of Boston have consumed most of my time and attention (and Maine has not been visited). Included in these pages are the locations, fortifications, weapons, technology and history connected with New England coast defense, primarily from 1895 until just after WW2. Coastal batteries, some antiaircraft features., and the harbors' submarine defenses are covered. Some general pages address how our coast defenses were intended to work and the factors which might have been responsible for making them more or less effective. The menu at left (and its pop-out submenues) will let you explore topics of interest to you. First-level menu items refer to the various New England states, to general topics in coast defense, or to other research topics. Second-level menu choices can refer to sites, to individual installations (like a fire control tower, a searchlight installation, or an artillery battery) or to sub-topics, Third-level menu choices are sometimes included for even more detail. Many pages also make use of tabbed subsections like the one you are now reading. Clicking on the tabs or menu bars will swap additional text into place. Photo galleries are usually included on the left side of the page, below the menu bar, and sometimes within the page content itself. Clicking on the image thumbnails or the slide show control buttons in a gallery will enable you to step through large-size copies of the images, which are also extensively captioned. Hovering over or clicking orange text like this or this symbol [NOTE] will pop up a footnote. Descriptions are based both on site visits by the author (and by others) and on secondary sources, like reports by the Army Corps of Engineers or the U.S. Coast and Geodetic Survey (USCGS), or the document archives of the Coast Defense Study Group (CDSG). Where possible, photos, charts, and maps have been included in image galleries. Clicking on General Topics in the Main Menu will access general descriptions of things like the history and organization of coast defense, the details of various types of artillery, or how the system of target location and fire control was designed to function. Some sites have only brief information reported for them, while others are described in depth, and many sites have not even been added to the main menu yet. Filling out this website will depend upon the progress of the field work and research for each coast defense asset, With over 700 coast defense sites in the New England area, site research will be a work-in-progress for quite a while. I am Paul Grigorieff, the author of this site. I became interested in coast defense through a hobby known as benchmark hunting, which involves searching for and reporting on survey marks that were set in the past and may (or may not) have survived to the present. Since many of these marks were set to locate points within harbor defense systems, as I searched for the marks, I often had to clamber around gun batteries or fire control bunkers. As a result, I decided to focus my efforts on creating a record of New England's coast defenses and publishing my results on these pages. I'm a newcomer to coast defense research, so if you find errors or omissions on these pages or would like to help out with additional details, please drop me an email. My thanks to the many public officials, property owners, caretakers, park rangers and others who were kind enough to let me visit, photograph, and catalog the slowly-vanishing traces of our coast defense system. Since many installlations (e.g., fire control towers) are now privately owned, I'm particularly grateful to the many folks who have let me come into their homes for the purposes of my work. In the beginning, Peter Payette, co-developer of the web site northamericanforts.com, provided his broad experience with coast defense in New England, particularly in New Hampshire. His knowledge kick-started my catalog of sites. The Coast Defense Study Group (CDSG) provided archival information and photos of many types of guns and technology, as well as foritifications. 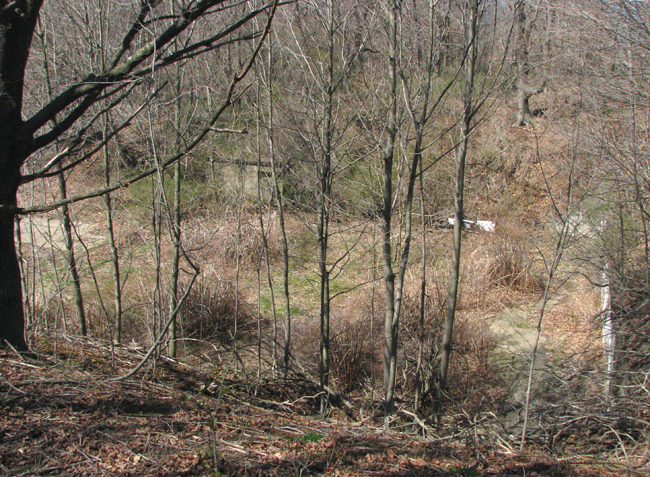 Bolling Smith has used his encyclopaedic knowledge of coast defense guns, installations, and history to solve several mysteries connected to New England sites. Mark Berhow was the source of most of my basic datafiles on coast defense and cheerfully helped me understand where to look for what. Gerald Butler gave his kind permission to use photographs from his books on Boston's Harbor Islands (Arcadia Publishing, 2000) and Military Annals of Nahant, Massachusetts. Tom Vaughan explained to me his painstaking research on and reconstruction of the architecture of the mortar batteries of Fort Banks in Winthrop, MA and gave me a copy of his paper reviewing the designs of all Coast Artillery mortar emplacements in the U.S. Mike McEavitt guided me to and about Fort Andrews and showed me a few of the items from his extensive collection of papers and artefacts. Many members of the ranger and maintenance staffs of Massachusetts State Parks (and particulaly those at Halibut Point and Fort Warren) have been more than generous to me with their time and effort. This website was built using software and tools from Project VII, which is fortunate, since I am a real novice at web development. Assistance from Project VII has also been very kindly given at many points where I ran into trouble. However, as the saying goes, all errors and omissions on this website are solely my responsibility and do necessarily represent the opinions or skills of my helpers or informants. For the reader who wants some additional, general knowledge about U.S.coast defense or details on its technical aspects, this short reading list should help. A very good, brief, general summary of the wheres, whats, and whys of U.S. coast defense can be found in McGovern T. and Smith, B., "American Coastal Defenses 1885-1950," Osprey Publishing Ltd., New York, 2008 (paperback, 64 pp.). With many beautiful technical illustrations by Peter Bull, this little book explains the different types of fortifications and weapons used during the period, with a good number of photos as well. It is available from Amazon.com. The modern "bible" for identifying coast defense guns, gun mounts, and many of the nuts and bolts of coast defense operations is Berhow, Mark A., "American Seacoast Defenses," 2nd Ed, CDSG Press, McLean, VA, 2004 (paperback, 632 pp.). This weighty "catalog of coast defense" can be ordered from CDSG. The book explains such diverse topics as the coast artillery fire control system, searchlight defenses, the coast defense submarine mine system, and the organization of coast defense troop units. This book also contains a very helpful set of symbols and abbreviations that were used on standard maps of the various harbor defenses. It is availble from CDSG.org. For the somewhat more technically inclined, there is the period book by Winslow, Eben E., "Notes on Seacoast Fortification Construction," Government Printing Office, Washington, D.C., 1920 (hardcover edition from CDSG, 438 pp.). This authoritative book, written just after the heyday of coast defense in America, reviews almost every aspect of coast defense construction and operations, and comes with a companion volume of technical drawings of weapons and fortifications. It was reprinted in 1994 by CDSG, and is available from them (at CDSG.org). A free .pdf copy can also be downloaded online from Google Books. Finally, a real flavor of the coast defenses of Boston can be obtained from Butler, Gerald, "The Military History of Boston's Harbor Islands," Arcadia Publishing, Charleston, S.C., 2000 (paperback, 127 pp.). This book consists almost entirely of photos and their captions, but it contains a wonderful range of period images of the fortifications of Boston Harbor and of the men of the Coast Artillery Corps. It is available from Amazon.com. Fortwiki.com is an encyclopedic website that gives details on every coast artillery fort in the U.S. I have also started a series of Wikipedia articles, with many illustrations, describing some basic aspects of coast defense operations, with an emphasis on fire control, observation instruments, and submarine mining. This link will get you started on the series, which also includes articles on several Boston forts. This section lists abbreviations for works that are cited extensively on this site, as well as photo or artwork credits that are widely used. Annex: These reports, usually entitled something like "Supplement to the Harbor Defense Project: Harbor Defenses of [Harbor Name] were comprehensive reviews of all guns, fire control structures, radars, and mine fields in a given harbor's defenses. They were usually dated 1944 or 1945. CDSGJ: The Coast Defense Study Group Journal. Earlier on, this publication was called the Coast Defense Journal (CDJ). MANM: Butler, Gerald W., Military Annals of Nahant, Massachusetts, Nahant Historical Society, Nahant, MA 1996. MWRA: Massachusetts Water Resources Administration. PG: Paul Grigorieff, myself, the author of this website. RCW: Report of Completed Works. These reports. often including drawings and maps, were written by the Army Corps of Engineers (ACE) upon the completion or modification of a Coast Artillery structure or emplacement. 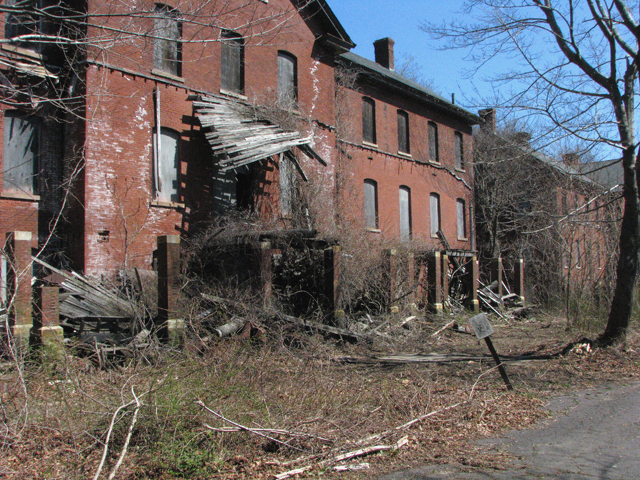 Tilton Report: Tilton, Rollin L. Brig. Gen., Chairman, "Report of the War Department Seacoast Defense Armament Board to the Deputy Chief of Staff, U.S. Army," Washington, D.C., 1 November 1946. This was a report of reccomendations on the post-war disposition of Coast Artillery assets and personnel. PDF file available from CDSG. This glossary lists a few terms, abbreviations and acronyms that are used on this website. AAIS: Anti-Aircraft Intelligence Service. This was the name for the network of anti-aircraft spotting stations that protected a harbor and collected spotting data used to direct anti-aircraft gun batteries. AAIS spotting stations tended to be located in "crow's nests" that opened through the roofs of fire control towers. Azimuth: A synonym for the bearing or angle, measured clockwise in degrees, between a reference vector and a point of interest (usually the location of a target to be fired upon). In the Coast Artillery, the reference vector was true south instead of true north. Guns were layed in terms of azimuth and range. BC: Barbette carriage. A barbette carriage was a gun carriage that mounted a large coast artillery gun on the surface of a gun platform. BC guns were often capable of traversing through 360 degrees, unless limited for safety reasons. BES: Base end station. A type of fire control observation station that was found at either end of a precisely-surveyed baseline (a line used to triangulate the positions of target ships). Multiple BESs could be located inside fire control towers, where several could be stacked one over another on different floors of the tower. CAC: The Coast Artillery Coprs, the Army branch that was tasked with coast defense between 1907 and 1950. Casemate: A fortress-like structure of steel, earth, or stone within which guns were mounted. The guns were fired through gun ports (or firing slits) in the casemate walls. Casemates were also used in the CAC to shelter the control and power stations for submarine mines protecting a harbor. CRF: Coincidence Range Finder. A type of range finder used in the Coast Artillery for fire control. It had a long, horizontal barrell (usually 9 feet long or longer) and worked by making separate images seen through mirrors at its ends coincide optically. DC: Disappearing carriage. 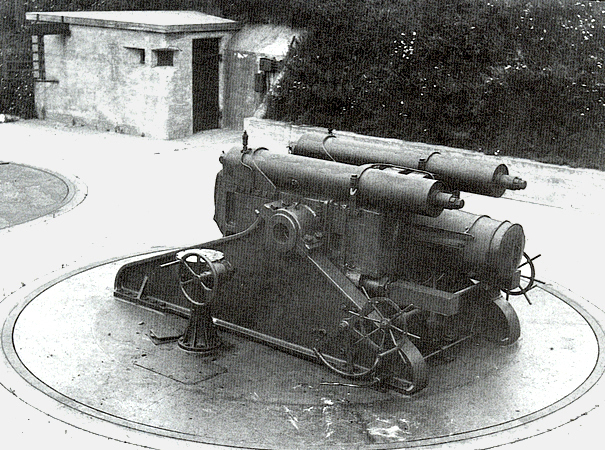 A type of carriage for a large coast artillery gun that used the force of the gun's recoil to retract the gun behind a protective parapet after it was fired. The gun woiuld remain protected until it was to be fired again, when a release on the carriage would be tripped, raising the gun over the parapet, to firing position. Guns mounted on disappearing carruages were usually limited to traversing less then 180 degrees. DP: Directing point. The directing point of a Coast Artillery battery was a precisely surveyed point that was used as the point of reference for adjusting the aim of individual guns in the battery. DPF: Depression Position Finder. An observation instrument used by the Coast Artillery that could be used by a single observing station to measure both the range and the azimuth between the instrument and a target. Endicott-Taft Period: The Endicott Period is generally defined as covering the years 1885-1904, and is the period during which the Endicott Board recommended and the U.S. government undertook a vast expansion in the harbor defenses of the country. A second board, the Taft Board, convened in 1905 and recommended other improvements to coast defense weapons and fortifications that were undertaken before WW1. Thus the Endicott-Taft Period as used here covers the years 1885-1915. FCS: Fire control structure. A term used on this website to refer to any of a number of different types of towers, houses, cottages, bunkers, manholes, or other structures that were used by the Coast Artillery to observe targets or the effects of fire for gun batteries or submarine mine commands. Fire control: In the Coast Artillery, fire control involves the personnel, facilities, technology and procedures used to observe designated targets, estimate their positions, calculate firing data for guns directed to hit those targets, and assess the effectiveness of such fire, making corrections where necessary. A plotting board was often used to derrive the actual firing coordinates for a gun battery. Fire control tower: As described here, a fire control tower was a multi-story FCS that usually contained two or more base end or observation stations. For this website, fire control towers are defined as having three or more stories. Gun numbers: The Coast Artillery numbered the guns of a battery staring with the one farthest to the right, as seen by an observer looking seaward from the battery. HECP: Harbor Entrance Control Post. A standard feature of WW2 defenses in each harbor, this building housed Army and Navy personnel, was sited so as to have a good overview of harbor activity, and controlled the entry and exit of all ships for its harbor. Manhole: A type of fire control bunker (almost always made of concrete and almost entirely buried in the earth) which did not have a door that swung open to the outside. Instead, a manhole was entered through a trapdoor and an entry shaft in its roof. These FCSs were usually one- or two-man stations, anywhere from 6 to 12 feet square. NGS: National Geodetic Survey. The agency presently responsible for maintaining geodetic marks in the United States. The NGS is a part of the National Oceanic and Atmospheric Administration (NOAA). It is the successor agency to the USCGS. OP: Observation Post. This was the name of a lookout point or observation station, usually one associated with a harbor defense gun group or command. A BES was a specialized observation station associated with the coast artillery fire control system. PID: Permanent identifier. A six-character identifier assigned by the NGS (formerly the USCGS ) to uniquely identify a geodetic mark, a type of survey marker placed to indicate the latitude and longitude of a particular point on the surface of the earth. Many observation instruments or gun batteries used by the Coast Artillery have had their locations precisely surveyed and marked with such markers, each of which has its own PID. Plotting board: As described here, a plotting board was a sort of analog computer that was used to plot the positions of targets for the Coast Artillery and to calculate the firing coordinates for a battery's guns. Plotting room: As described here, a plotting room was an area that housed a plotting board and troops of the Range Section for a Coast Artillery gun battery who caculated firing coordinates for the battery and sent this information to it. USCGS: U.S. Coast and Geodetic Survey. The federal agency that used to be responsible for setting and maintaining geodetic marks, now the responsibility of the NGS. USE: The U.S. Engineers, also referred to as the Army Engineers or the Army Corps of Engineers. Many Coast Artillery documents reference the U.S. Engineers, and USE is also often seen as a label on geodetic markers, since many of these were surveyed and emplaced by that organization. Staff of the USCGS were sometimes also members of the USE, or the Army Engineers. This is a new website, and it will be "under construction" for a long time.. This website was set up in April, 2010, and only sites in Massachusetts and a few in New Hampshire and Rhode Island have been described so far. What's the "filler text" found on some pages? The "quasi-Latin" text you may see on some pages is a temporary place-holder that will be removed as the pages are written. A few menu tabs are also blank, awaiting their content. Here are a few photos of this classic Coast Artillery fort. The detailed section on this fort contains many more. 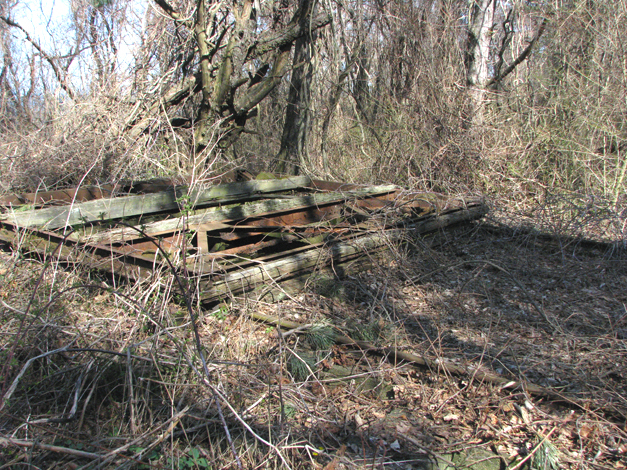 Demolition of many of the fort's assets took place in the Fall of 2011, after my visits. © 2010-2012 Paul Grigorieff. All rights reserved. Permission is hereby given for limited reuse of images and accounts for non-commercial purposes. Some images may be copyrighted by other authors, as described.